You are crossing a narrow rope bridge over a deep chasm. The sky above is the blue of glacial melt, and you hear rushing water in the darkness far below. Half way across the ravine, a warrior draws her sword. You cannot retreat; the bridge is unstable, and the stranger quickly advances. Beyond the bridge, you see delicate red buds on the trees and the path into the woods. Your breath is steady and your eyes are soft, as if gazing at distant mountains. A single beach leaf, a vestige of an autumn long ago, falls into the gorge below. What choices would you make on this bridge, knowing that your decision will have mortal and irrevocable consequences? Would you hesitate, or walk forward? Would you pray, or leap? One can view this parable as a reflection of our transient and complex lives. Every day, we make choices that dictate the course of our lives. How do we make decisions in our brief lifespans, and how do we bravely welcome the consequences of these choices? Many of us hop through life like timid rabbits: unsure of the correct path, we feel apprehension even after making a commitment. Instead of living in a state of indecision, Aikido practice teaches us how to make clear choices, and to accept our decisions with cheerful equanimity. In class, Kazuo Chiba Sensei would exhort “commit… and let go!” When I first heard him say this, I felt a tremendous resonance: “Yes, that’s it!” His statement refers to the cultivation of martial skill, but it also a mandate for right living. 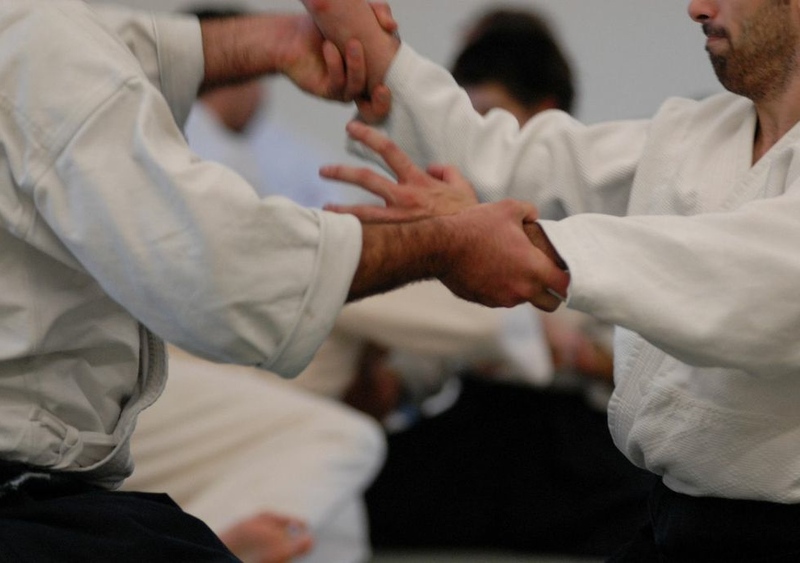 Through Aikido principles, we learn how to maneuver life’s conflicts and possibilities. Commit… and let go! What does this mean? When an aikidoka attacks, she makes a complete commitment to the strike. The defender also commits unequivocally to a response: there is no time or space for hesitation. Aikido movements emphasize relaxation instead of muscular strength. For instance, instead of closing one’s hand in a fist and taking a rigid, combative posture, usually an aikidoka defends with open hands and a relaxed stance. By releasing extraneous tension, the student calmly responds to stressful situations, reducing the chance of unnecessary harm to themselves or others. Contraction, and release: body and muscle do their work, and then one lets go of everything superfluous, including negative emotions like vindictiveness and anger. In Aikido, the resistance of a grab teaches the student how to move in a relaxed and efficient manner. In addition, proper grabbing skills allow the aikidoka to to neutralize an attack without undue harm. Instead of relying on strikes and kicks, the student uses pinning techniques, joint locks and chokes. Aikido also teaches appropriate strategy. By learning how to relax through proper use of the body and breath, the aikidoka learns how to spontaneously employ the correct response in the moment of the attack. Much about martial strategy and the peaceful avoidance of conflict can be learned from the intuitive actions of animals in conflict. Take a careful look at the photograph below. Commit…and Let Go! The Dog, The Rooster, and My Father. The prey turns the tables on the predator. Aikido movements vary tremendously. A technique might involve direct entries and strikes. These movements embody the spirit of irimi, or initiative. 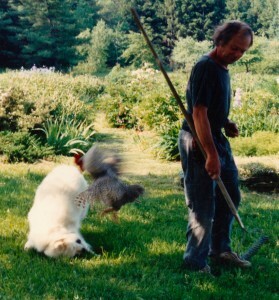 Other times, aikido is circular, soft, and receptive, embodying the spirit of tenkan and kaiten (turning movments): the quick evasion of the dog avoiding the rooster’s spurs. Photograph by Jane Pincus. Despite the disparity in size and strength, the rooster attacks the dog’s eyes. 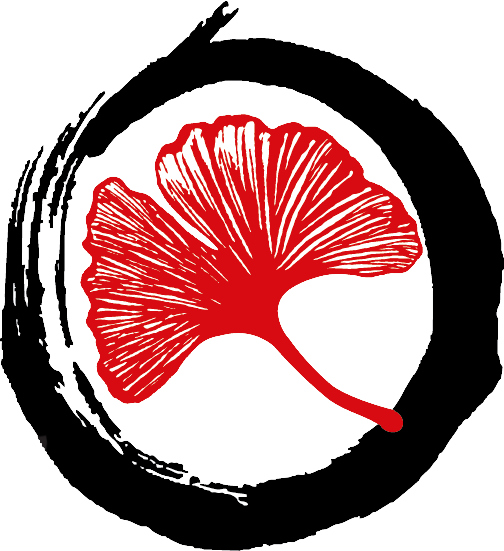 The rooster has the martial advantage because he attacks in the spirit of irimi – direct entering – a movement that perfectly embodies commitment. In turn, the dog instinctively protects her eyes with a circular evasion: the principle of tenkan and kaiten (a turning or pivoting motion in Aikido). In a martial encounter, there is no time for analysis and premeditation; instinctual action governs the response of rooster and dog alike. I demonstrate another example of the commitment and release in this video, which shows a defense against a strike to the solar plexus. One entry is very direct, in which I take the initiative in order to neutralize the attack. The second defense is more circular and more evasive. This basic technique is called iriminage – entering throw. The two energies – commitment and release -are not mutually exclusive; every technique integrates both principles into a harmonious unity. For instance, the defender makes a decisive commitment to evade the attack with a soft, circular response. In softness, there is also a sense of purpose and clarity. Meanwhile, a linear and direct movement in Aikido manifests softness, release, and muscular efficiency rather than excessive tension. In hardness, there is also sensitivity, grace and awareness. Through relaxed and integrated movement, Aikido teaches the freedom of non-attachment, the assurance of commitment, and the confidence to utilize the appropriate strategy. By learning how to abandon the extraneous and commit to a clear path, we discover a sense of purpose and clarity in this chaotic world. This journal entry explores the principles of courage and release in Aikido and Greek Lyric poetry (in case you were just thinking about this matter). Discover what the Japanese film director Akira Kurosawa had in common with Archilochus, the ancient Greek warrior/poet, and the fundamental lesson of the Bhagavad Gita on how we should transform our lives in order to discover true happiness.